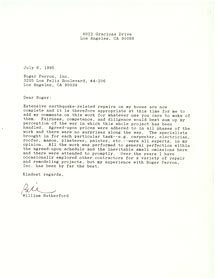 Rutherford » Roger Perron Inc.
Extensive earthquake-related repairs on my house are now complete and it is therefore appropriate at this time for me to add my comments on this work for whatever use you care to make of them. Fairness, competence, and diligence would best sum up my perception of the way in which this whole project has been handled. Agreed-upon prices were adhered to in all phases of the work and there were no surprises along the way. The specialists brought in for each particular task — e.g., carpenter, electrician, roofer, mason, plasterer, painter, etc. — were all experts, in my opinion. All the work was performed to general perfection within the agreed-upon schedule and the inevitable small omissions here and there were attended to promptly. Over the years I have occasionally employed other contractors for a variety of repair and remodeling projects, but my experience with Roger Perron, Inc., has been by far the best.